November, 2006, and back to passenger-happy llinois. This time it was an hour of sunset shooting in Lisle, on the BNSF mainline from Chicago to Aurora. Late in the afternoon there is a train every few minutes thanks to METRA and Amtrak. Somehow, this photo strikes me as quintessentially midwestern. Broad horizon, the longest commuter train I've ever seen, a glorious glow, train heading west, and a shivering photographer behind the lens. I can only thank the splendid new Olympus lens which captured the detail for my digital camera. Shining equipment, up to date announcements on the station's public address system and monitors, and a beautiful station. Quite a contrast to the situtation in the Boston area, where I live, where we've put our money into corrupt tunnel collapses and stations with no monitors and with too few trains, many of which are late and dirty. Perhaps Horace Greeley was right: "Go West, Young Man". Photo taken with Olympus E-300 DSLR, f 11-22 lens (35 equiv 22-44). 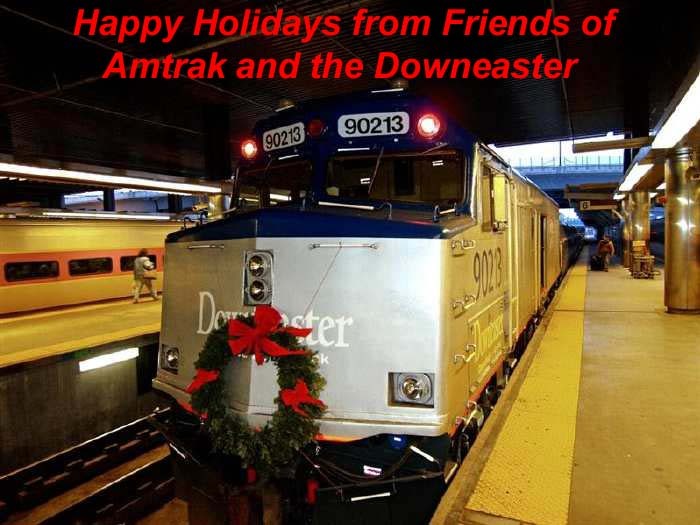 December 15, 2006, and the holiday spirit was soaring at North Station in Boston, where this photo was taken of Amtrak's wildly successful Downeaster during its Fifth Anniversary celebration. Trainriders/Northeast, with the help of the Northern New England Passenger Rail Authority, Hannaford Market, Global Events, Headlight Audio, OurFair Carousel, and many happy Amtrak employees pulled off a real class event.that incuded stirring music, lots of great food and drinks on board, and souvineers for lucky passengers. There was a big party in Portland, kids were special guests up and down the line, and all involved showed that when citizens get organized, the result can be more trains (a fifth round trip will be added soon) and good trains. We want to thank Wayne Davis of Trainriders/NE for inviting us along so we could snap away with great delight. 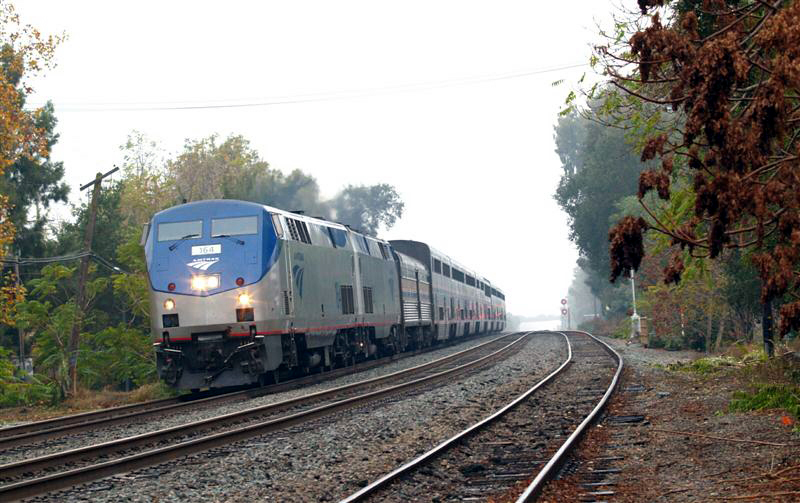 Lets start the New Year with the California Zephyr arriving in Davis, California, from Emeryville on a damp autumnal day in November 2006 -- already 30 minutes late. When I think about this train I don't know whether to laugh or cry. It traverses some of the most glorious landscape in the world, and attracts travelers from many countries. Since new facilities were installed in Oakland it actually runs now with its windows clean. Yet, by all accounts the train is just going down, down, down. It is virtually NEVER on time thanks to Union Pacific follies and it is now subject to having its dining car and sighseer lounge (a wonderful source of conviviality and picture taking), replaced by one of Amtrak's new diner-lounge contraptions, featuring the beancounter special pre-cooked, plastic plated road food. Work rules and union agreements combined with Congressional micro-management and widely-reported poor train management have added up to an utter lack of imagination in customer service. We can only hope that the new Amtrak upper management will see this train as a national treasure and get its act together with Union Pacific and Congress to return it to something resembling a national treasure. If it can do it on the Empire Builder, which well serves a lot of rural politicians, it can do it for a train that serves the world. Photographed with Olympus E-300 dslr and Sigma 55-200mm lens. News that Florida may get off the dime and use some funding available to start a new service on the old Florida East Coast line between Jacksonville and Miami sent me to my ancient pile of slides. Happily, the result was the first railroad photo ever taken by me. 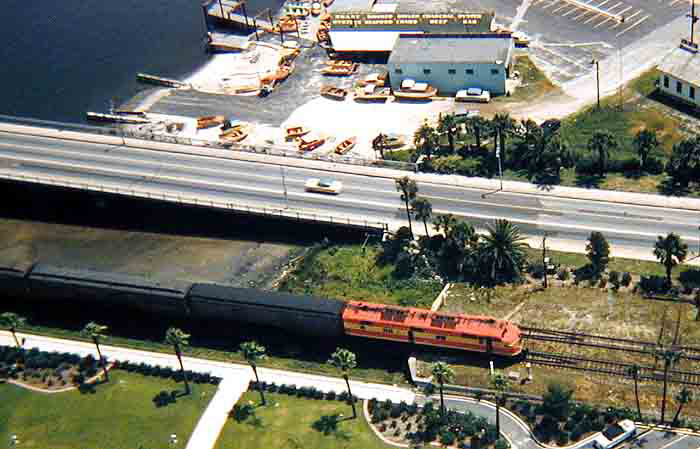 The date was the summer of 1956, and it was taken of an FEC passenger train from the roof of the Prudential building in Jacksonville. A high school sophomore, I was visiting friends there for the (miserable) pre-airconditioning summer. Hence began a long and enjoyable photography quest. And more than a few out of the way perches! The camera was a Kodak Signet loaded with Kodachrome. Changes last made on: February 25, 2007.